West Ham have told Marko Arnautovic he can leave the club this month if they receive an offer worth £50m, according to Sky sources. The Austrian forward has attracted interested from Chinese clubs - believed to be Shanghai SIPG and Guangzhou Evergrande - and West Ham turned down a £35m bid for him in this transfer window. Arnautovic's team-mate Michail Antonio revealed on Goals on Sunday that the 29 year old wanted to leave the London Stadium, and he appeared to wave goodbye to the fans when he was substituted during the win over Arsenal earlier this month. 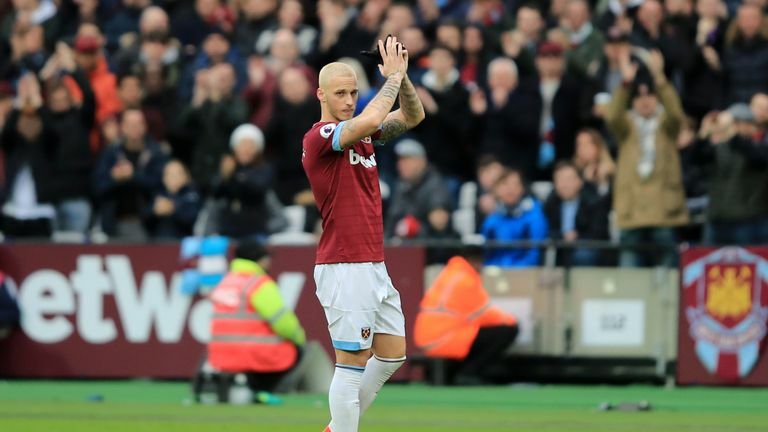 Arnautovic has been left out of West Ham's squad for their FA Cup fourth-round match against AFC Wimbledon on Saturday, and now looks as though he may have played his last game for the club. West Ham are in talks to sign Celta Vigo striker Maxi Gomez, but the move is understood to be independent of Arnautovic's future. The La Liga club want to keep Gomez, but he is understood to have a £43.3m release clause in his contract. If West Ham do sign the 22-year-old Uruguayan, the deal will likely eclipse the signing of Felipe Anderson as their record purchase.